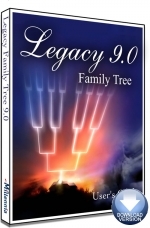 Legacy Family Tree Software & Books Note to current Legacy 9.0 customers: if you have already installed Legacy 9, you do not need to repurchase Legacy to update to the latest version. This is a free update which can be downloaded from here. Note to potential Legacy 9.0 customers: when you purchase Legacy 9 below, you are entitled to all version 9 updates - free of charge. Updates can always be downloaded from here. If you have not yet downloaded Legacy, when you do, it will always be the latest version. Legacy is available for Windows only. Mac users click here to learn how to run Legacy on your Mac. Legacy 9.0 Deluxe software - download-only version. Legacy Charting Deluxe software (installed when Legacy 9.0 is installed). Official 301-page Legacy User's Guide, PDF version. The official, 301-page Legacy 9 User's Guide. PDF version.